Have I mentioned how much I adore homemade ice cream? I don’t quite remember when this love affair began for me, but once you get used to the silky quality and the endless options for what you can make, you’ll wonder how you ever lived without an ice cream maker. (Don’t have one yet? Check out the ice cream tag link on the right by scrolling down and you can link to my favorite type.) This ice cream is named for the childhood cookie memory of Snickerdoodle cookies – those simple sugar cookies that get a kick by being rolled in cinnamon sugar before baking. 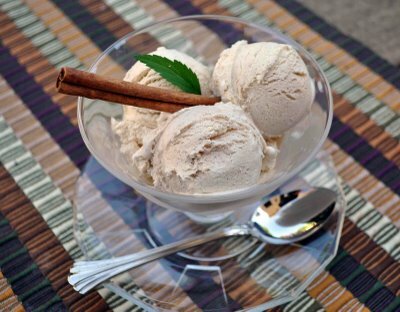 Here, the addition of cinnamon to a basic vanilla custard ice cream invokes the same flavor profile. (Tip: use a whisk to get the cinnamon to incorporate into the ice cream base.) Make this today and you’ll be ready for the 90 degree weather they are forecasting for Father’s Day tomorrow! Whisk together the sugar, milk and egg yolks and cook in a double boiler over simmering water until the mixture thickens, about 10 minutes, stirring frequently. Remove from heat and add vanilla, cream and cinnamon. Refrigerate until cool, and then freeze in an ice cream machine according to manufacturer’s directions and then freeze until firm in the freezer.